Seems kind of odd, doesn’t it? Water damage to a chimney. You might think something as supposedly as strong and stout as a chimney wouldn’t need protection from water. But water is extremely powerful – just witness the Grand Canyon! Your chimney is constantly exposed to weather – and often that appears as water in one form or another: usually rain or snow. Not only can water do serious damage in your house if it gets inside, it can literally break the chimney apart through the freeze-thaw cycle during winter weather. Taking care of your chimney involves more than inside maintenance; it also means applying a top-quality, reasonably-priced water repellant to the outside. 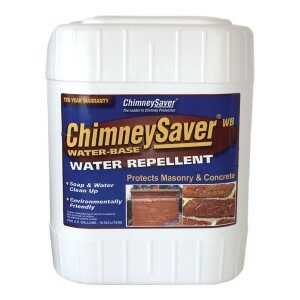 At Emerald City Chimney, we use and recommend ChimneySaverâ Water Repellant to extend the life of your chimney and give you further peace of mind. ChimneySaver doesn’t plug the surface with solid acrylics or silicones, so the chimney can breathe, allowing water vapors produced inside to escape to the outside. Additionally, ChimneySaver can prevent the ugly stains you often see on brickwork: the result of mineral salts evaporating out of the bricks and mortar after water penetration. Contact Emerald City Chimney for more information on this product or see our other products and services or pricing.